There are many ski lift design elements that work together to transport skiers up and down a mountain. Finding out how each type of lift is designed to work will give you a better understanding when being transported. Ski lifts can be found at just about any ski resort. They are designed to carry skiers to the top of the mountain so that they can ski down. There are various types of ski lifts including those that are on the surface and those that are aerial. A magic carpet lift is a surface lift that is perfect for beginners since all you do it step on and hold on to a bar. Other surface lifts are rope tows or poma lifts. Chair lifts are aerial lifts that are designed as a series of chairs that are suspended by a cable. The cable is driven by motors. Chair lifts can be single, double, triple or quad. There have been updates over the years to the ski lift design, but the basic function remains the same. A lift runs by a motor and transports skiers with an endless cable that runs from the bottom of the mountain to the top. The type of lift used at the ski area depends on the terrain, the amount of skiers and the resort's budget. The most basic ski lift is the surface lift. It is used on shallow grade areas of the mountain and is perfect for both children and beginner skiers. There are several types of surface lifts. Each is unique in their design. The rope tow is the simplest in design. It is a rope that has handles attached to it. Skiers can grab onto a handle and be pulled up the hill. The poma lift or platter pull consists of a cable and a pole. The cable rotates around two bullwheels; one at each end of the lift. The pole is suspended from the cable and has a platter at the end. The skier simply holds on to the pole and secures the platter between their legs to be transported. This lift was extremely popular in the 60s and 70s. A magic carpet is designed as a moving conveyor belt that is level with the surface of the snow. All of the mechanisms that cause it to work are hidden beneath. It is designed to have the passenger step onto the belt and be transported up the hill where they are able to glide off. Fixed grip chair lifts are the most inexpensive and practical lift. A chair is attached to a cable. The chair's position does not move but the cable does. This lift can hold anywhere from two to six people. It is not used on high traffic areas or on high mountains. Detachable chair lifts are the most popular and found at almost any ski resort. The fast-moving lift consists of chairs that detach at the base and top of the lift from a cable. A moving carousel holds the cable and allows for a smooth ride and slow loading and unloading. A gondola lift protects riders from the elements. It consists of an enclosed cabin that can hold up to 12 or more skiers. It works like a detachable lift and releases the cable onto a carousel. The gondola lift allows passengers to get off or on with ease and is found at large resorts. Ski lift designs remain the same in concept but are often updated with the latest technology and features. 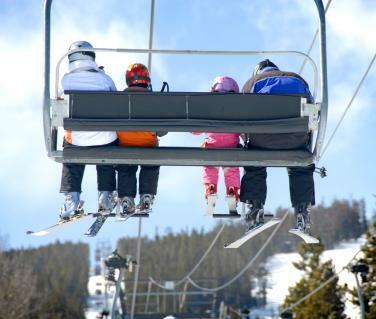 The type of lift found at a resort depends on many factors and many resorts have several types of lifts from surface to aerial. In order to avoid ski lift accidents, skiers are advised to use caution when on a lift and to secure any loose clothing that may get caught in the lift's mechanisms. Reputable resorts have frequent safety inspections in order to make sure the lift is functioning properly.